DopStudio Vascular Doppler with USB probes - DopStudio Vascular Doppler with USB probes - Products - SMT medical GmbH & Co.
USB ultrasound probes turn your PC into a professional spectral Doppler! 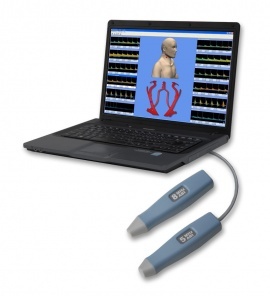 With DopStudio, Ultrasound Doppler Sonography has never been easier: Plug the probe cable into the USB port of your PC or notebook and perform neuro-vascular and peripheral-vascular insonations, guided by an intuitive, powerful Doppler program. View high resolution spectra on the screen and listen to excellent Doppler audio-signals in real time, features usually available in expensive high-end instruments only. Document your Doppler exams, paperless in the DopStudio database, directly attached to the electronic patient chart, emailed or printed in concise, impressive reports. 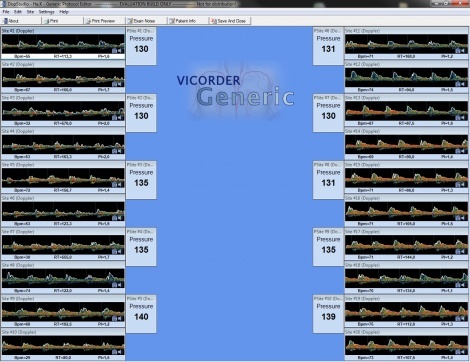 Real-time determination of flow velocity parameters such as Vpeak, Vmean, PI, RI, etc. The installation of the new DopStudio software on your PC or notebook by CD or download will take only a few minutes. Multiple use and operation in a network environment, e.g. as a reader station for evaluation of exam results, are comprised in the life-time software license making DopStudio© a sensible, cost-effective investment for years to come. 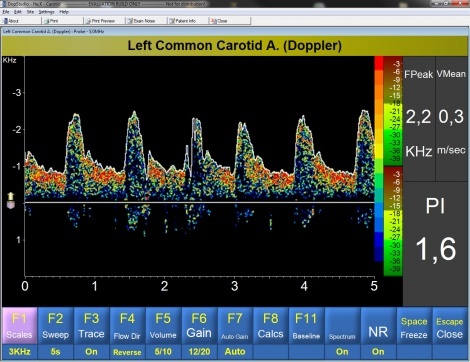 With DopStudio, Doppler exams of larger, deeper located vessels are carried out using the 5 MHz and of smaller, superficial vessels using the 8 MHz USB Doppler probe. The light weight probes allow easy manual guidance and precise vessels identification due to their conical form and small tip, even in peri-orbital or digital insonations. With a USB probe cable of more than two meters (6.5 ft.), access to neck, upper and lower limbs is comfortably attained, not requiring a close location of the PC. Frequently performed exams have been preprogrammed into user defined protocols, supported by 3D animated graphics identifying insonated vessels. Besides standard protocols a generic protocol with up to 20 spectra can be user programmed to optimally suit your specific requirements. All settings such as vessel name, time base, gain etc. can be adjusted by the user and stored in a user defined protocol. Users can create an unlimited number of these individualized protocols, offering an immediate recall of their settings at any time, reducing test time and effort. Programming of settings could not be easier: While performing the test, the desired settings are selected and saved in a new protocol or added to an existing protocol. Done “on the fly”, protocol settings are intuitive and do not require any special computer knowledge. During exams and insonations all adjustments can also be made manually, ensuring flexibility and speed. Vessel names can also be modified after completion of tests. Powered by a 256 point Fast Fourier Transform (FFT) the high resolution spectral analysis offers a crisp color display of Doppler flow velocity wave forms. In particular non-versed operators profit from this visual enhancement, leading to a faster learning curve in performing insonations and offering a far more instructive documentation. Adjustment of displayed spectra to an optimum gain can be attained by manual control or more comfortably by using the self-adjusting Autogain. The envelope can be displayed or turned off. Parameters are determined and shown in real-time. Indicators can be user selected, allowing display of only those parameters meaningful to the operator. All Doppler controls are at your fingertips! The DopTrax feature offers recording of spectra and audio signals while insonations are in progress. Performed insonations can be replayed at any time. Especially in difficult pathological cases insonations can be reevaluated among peers. DopTrax can also be used as a means of quality control allowing retrospective verification. Enhanced by 3D graphs, comprehensive Exam reports can document up to 20 spectra on a single A4 page. With the completion of the exam, single or combined test reports are available in pdf format or as a preview. When standard protocols are employed graphs of the arterial vasculature assist in vessel identification. Report related pdf files can be identified by file names which are a combination of patient name, date, and time stamp, optionally stored on a logic folder on a remote server. This allows an automated import of pdf reports into the electronic patient chart – without additional cost. DopStudio offers many useful database functions, usually only available with much more expensive equipment. Patient and test data, including Doppler spectra and optional audio signals are stored as the exam is completed. 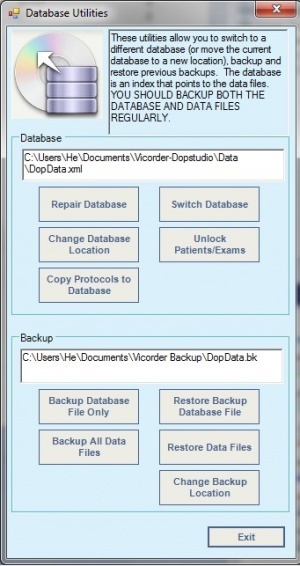 For additional assurance, a backup of the database is automatically stored. Folders of database and backup are user configurable, ensuring safety and ease of operations. Several instruments can save tests in a common DopStudio database, allowing exchange and retrieval of data within a network environment. The software can also be installed to serve as a workstation offering access to Doppler tests from any networked DopStudio data base location. DopStudio comes with a lifetime software license, multiple installations are allowed. 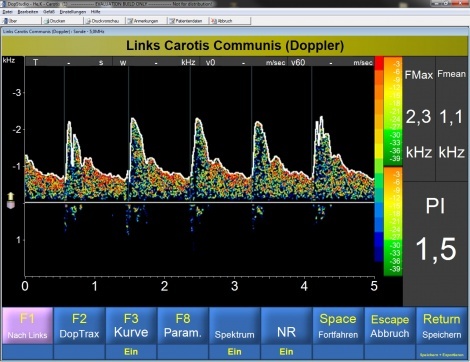 When the USB probe is not connected, the software acts as a workstation and offers access to Doppler exams stored in the database. With ease and cost-efficiency, DopStudio® results can be transferred to any information system offering a PDF import function. After the test reports are generated in PDF format and labeled with patient name, date and time for unique identification. Files are staved in a predefined folder, locally or within the network. As virtually all current practice or hospital information systems feature a PDF import function placing PDFs into the electronic patient chart requires only a mouse click in most cases. Also a polling feature may be employed for automated collection and attachment. 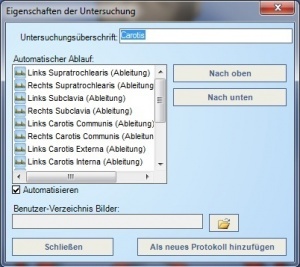 Offered free-off charge within the DopStudio software, this solution comes with a host of advantages: Marginal or no cost within the existing information system; one file for a complete exam with unlimited number of insonations; low storage space; report can be viewed, printed or emailed from any work place within the network. DopStudio is a product of Skidmore Medical Ltd., Bristol, UK.